Every time the fall season arrives in NYC I’m always excited to start breaking out the various types of boots I have in my closet. From knee-high boots to ankle boots, I can practically wear boots all year-round if I had my way. Depending on the height of the heel, boots are pretty comfortable while looking chic as you walk the city streets. All New Yorkers rely on walking to literally everywhere in this big city. It’s important for a girl like me to look good while being able to walk easily and comfortably all day long without wincing at my poor battered feet. When combat boots started to become an added trend to the fall boots collection, I instantly fell in love. Combat boots has been considered to be more of a fashion staple from the ’90s along with vests and long, boho chic dresses (which have also made a fashion comeback). The thing to always remember about fashion is it’s cyclical. What may not be in fashion now will eventually come back in fashion a few years down the road. 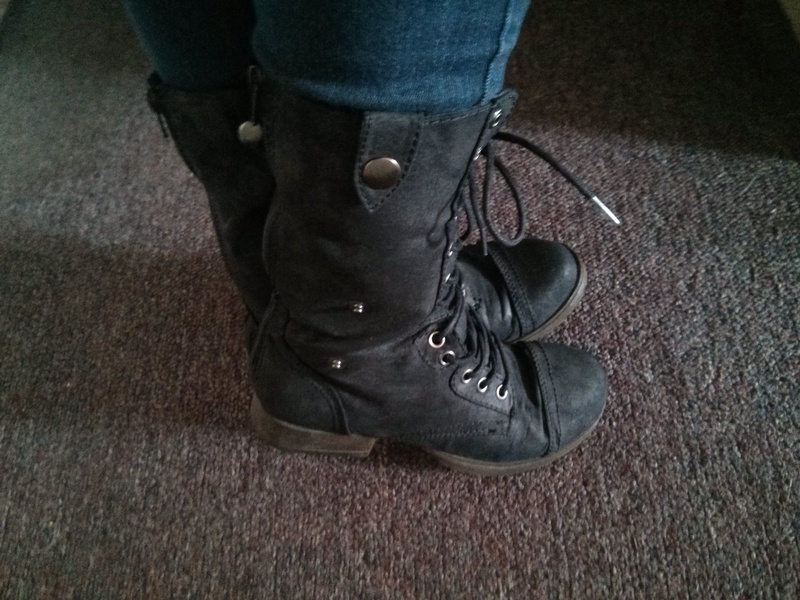 What I really love about combat boots is how edgy and versatile these shoes can really be. Wearing my own combat boots with skinny jeans. It also doubles as ankle boots when I unzip the back slightly and let the flaps on the side hang! Like most boots you wear, they can either be dressed up or down. It really depends on what kind of look you’re going for. What’s different about the combat boots compared to other boots is the edgy style it retains. You may think wearing combat boots is only good with a pair of skinny jeans and a comfy button down plaid shirt, but this look is doable with dresses and skirts. If you want to look girly and feminine but with a dash of daring and toughness to update the ultra-feminine look, wearing a pair of combat boots can do the trick. It strikes the right balance of, what I would call, sugar and spice and everything nice. It also makes a really strong and bold fashion statement. A great example of wearing a super cute dress with a pair of combat boots. I typically like looking super feminine whenever I get dressed to go out for the day, but every now and then, I do like to do something different with my look. Something a little unexpected. Wearing combat boots with a soft and pretty dress gives me the comfort of staying girly while keeping people guessing by adding a bit of edge to my style. Aside from the wonderful contrast this look has, combat boots are one of the most comfortable footwear to wear for walking. Stylish and comfortable? Sign me up! Combat boots are a great investment for your fall season style if you like versatility, edge, and comfort all wrapped into one. I love combat boots. Mine wore out a few months ago though, so I need to get some new ones for this season! I’d really like to find a nice rugged pair of combats to wear on a daily basis. Yours look pretty fantastic! I also love that juxtaposition of the frilly or boho with the edgier look.